The short version: in the beginning, there was nothing, which then exploded. 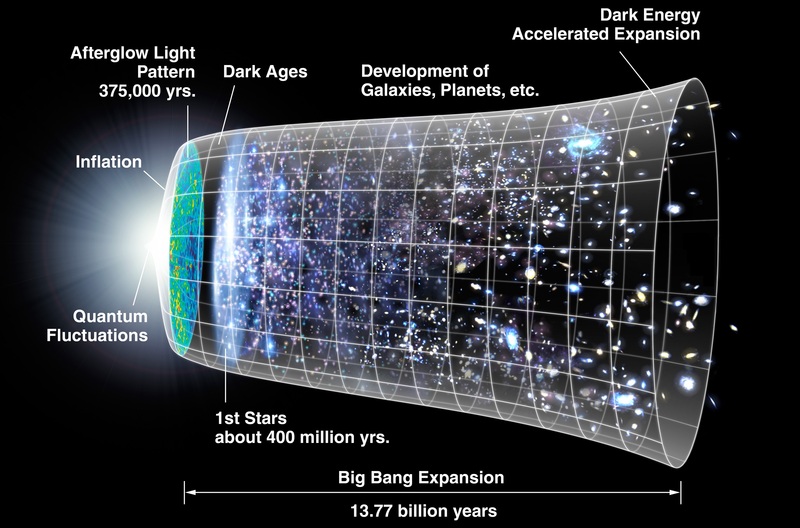 The longer version: all the matter in the universe was compressed into the smallest possible volume. Try to understand that this is so much matter that the force of gravity warps the laws of physics as we know them. The whole thing is is under so much pressure that it explodes – forming the universe as we know it as the laws of physics change radically from picosecond to picosecond, and eventually energy cools and congeals into matter. In the early millenia of what is sometimes referred to as the Hadean era of the Earth, there were no rocks as we would commonly understand the term – it was too hot for them to form. Still, the Earth was slowly cooling and solidifying. It’s worth noting that the Sun itself was not as hot at this time – like the larger planets of our solar system, it was still accreting matter to itself. Rockballs like the Earth (and Mars and Venus) were largely done with this process (although the occasional meteor or cometary impacts still occurred). By the end of this era, approximately 3,800,000,000 years ago, the Earth had cooled sufficiently to allow for the stable formation of rocks, and its surface had begun to split into tectonic plates. Most importantly for humanity’s future, life had begun: the earliest evidence of photosynthesis dates from around this time. The majestic oceans of planet Earth were formed neither quickly nor simply. It took literally millions of years between the first surface water’s appearance and the creation of the primordial sea. Several factors contributed to this: the gradual cooling of the Earth was the first and most important, but also important was the slow release of water from existing minerals, the condensation of steam, and even the addition of water in the form of ice from occasional cometary collisions with the planet. The first waters soon became the habitat of early prokaryotes – whose biochemical processes led to the formation of still more water. Indeed, it is possible that the majority of water on the planet today exists as a result of these organisms. The earliest known bipedal vertebrate, eudibamus cursoris was a small parareptile. The sole specimen that has been found (in Thuringia, Germany) measured about 25 cm long – about the size of a house cat. Reconstructions of it give it an appearance resembling a cross between a tiny velociraptor and a modern iguana. The sole specimen of it known to science was discovered in 2000 by a paleontological team including David S. Berman, Robert R. Reisz, Diane Scott, Amy C. Henrici, Stuart S. Sumida and Thomas Martens. The species is believed to have existed for a span of about five million years or so. Pangaea was a super-continent – an agglomeration of multiple continents – that came into being about 250 million years ago. It was composed of all the continents we know today fused into a single landmass, surrounded by a single ocean (called Panthalassa) – and was the last time such a thing occurred. In fact, it was slightly larger than the combined areas of the modern continents, as supercontinent formation tends to lead to lower sea levels. Pangaea (the name comes from the Greek Pan meaning All and Gaea meaning Earth) existed during the Paleozoic and Mesozoic eras, and its best known inhabitants were the dinosaurs. It began to break up approximately 75 million years after it formed, although the continents would not reach anything approximating their modern positions until only about 35 million years ago, when the Indian subcontinent collided with Asia. Everyone loves the dinosaurs. A lot of people – if the Jurassic Park films are to be believed – would like to see them come back. But without their extinction, we wouldn’t be here today. Even now, it’s still not clear what exactly caused the extinction event – but the best known hypothesis is that of Luis and Walter Alvarez, which states that a meteoric or cometary impact caused a nuclear winter-like effect that altered the climate drastically, wiping out something like 75% of all species alive at the time. The effects were particularly felt by larger species – which included most dinosaurs. In the wake of the event, now open evolutionary niches were occupied by mammals and birds, including our own ancestors. Australopithecus was an early proto-hominid that evolved in Eastern Africa around 4 million years ago. It consisted of a number of sub-species: A. anamensis, A. afarensis, A. sediba, and A. africanus; and two more sub-species whose genus is disputed: A. robustus and A. boisei. Over the course of two million years or so, the various Australopithecenes ranged across Eastern and Southern Africa. The Australopithecines evolved about 2 million years after the split between the ancestral roots of humanity and chimpanzees (our closest relative), and one or more of the various sub-species of Australopithecus is likely to have been the progenitor of the Homo Genus, to which modern humanity (homo sapiens sapiens) belongs. The earliest known example of tool making by a hominid species, the Mousterian tools were created by members of the species homo neanderthalensis. They were primarily a flint-based technology, consisting mostly of cutting and scraping tools. Their name derives from Le Moustier in France, where such tools were discovered. However, it is unlikely that Le Moustier is the actual site of the tools’ origin, as similar tools have been found throughout Europe, the Near East and North Africa. Wherever they were invented, they clearly disseminated widely and – one assumes – swiftly. The advent of tool making is the beginning of humanity’s technology-enabled conquest of the world. Up until this point, our ancestors were one species among many – a little smarter than most, but not especially better adapted than any other. Tool making changed that, making hominid species deadlier and more efficient hunters, and leading in time to the technological civilization that anyone reading this lives in today. The Roman Empire had been in decline for centuries by the time Odoacer deposed the child emperor Romulus Augustus in 476 and declared himself ruler of Italy – the first time any non-Roman had done so. His Italy remained more or less a client state of the Eastern Empire (the portion of the old Roman Empire that would become better known as Byzantium, and last for just under another millennium), and that in itself helps to illustrate the decay of Rome. From the point several centuries earlier at which Roman expansion ceased, to the splitting of the Empire into East and West in 395 after the death of Emperor Theodosius, the signs had been present for some time, and only growing stronger. Even Odoacer’s sack of Rome was the third in less than seventy years, and when a nation can no longer defend its capital, you know things aren’t going well. Even so, the use of this date as the official Fall of Rome is fairly arbitrary – there are no shortage of other dates that have a just claim to the title. Originally discovered in 1930, Pluto was at that time classed as a planet, and named for the Roman god of the Underworld. However, as the years went by, evidence mounted that it was not truly a major planet. Although it did have moons of its own, it also had an eccentric orbit (which crosses that of Neptune, the next furthest out planet) and a lower mass than any other planet. The discovery that Pluto was just one of a number of bodies in the Kuiper Belt, many of them with comparable size and mass, also weakened the arguments for considering it a planet. Finally, a new definition of what a planet issued by the International Astronomical Union on August 24, 2006, excluded Pluto. On September 13, Pluto was named a Dwarf Planet, alongside Ceres, Haumea, Makemake, and Eris – all of which, other than Ceres, are also Kuiper Belt objects. All arts and popular entertainment. Events which have no recorded date. Depressions, booms, legislation and important firsts. Events that occurred only in works of fiction. Events projected to occur at some point in the future. Events of either dubious historicity or outright myth. Events in religious history and religious dogma. Discoveries, new technologies and events discovered only through the application of science. Sporting events, or events related to athletes.